If you lead a packed week, it’s better you follow a weekly agenda. It’s like your daily agenda template that will enable keep you informed on what tasks to be done at each day of the week. You can follow a weekly schedule both for your office and domestic or personal life. This way you will never have to face missed appointments or meetings. pcc.edu | A sample weekly study schedule template is an interesting template containing a table in which the user i.e. a student can fill up his schedule for an entire week. He can use this template to judicially divide his time. And through this template he can organise his life better. Thus parents and teachers urge students to follow a schedule. And thus students can download this interesting tabular format which he can fill up to use as study schedule. This template can be downloaded from the link below for free access. 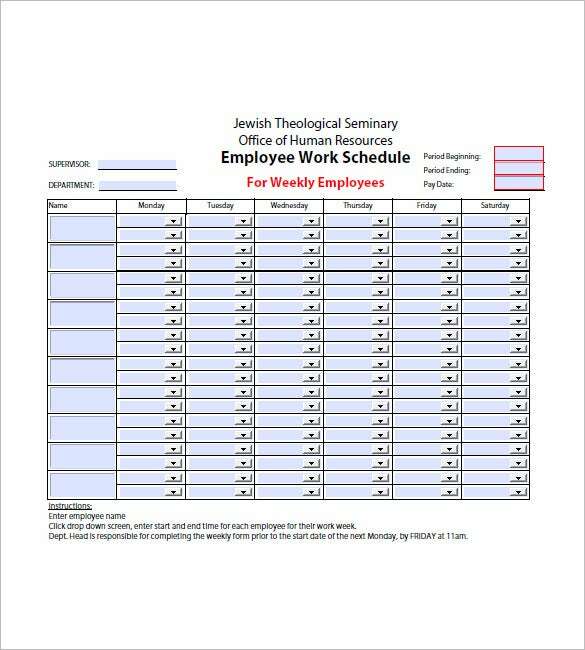 jtsa.edu | An employee weekly agenda template is a wise tool used by employers for keeping an track on the employees’ schedule and creating maximum productivity. 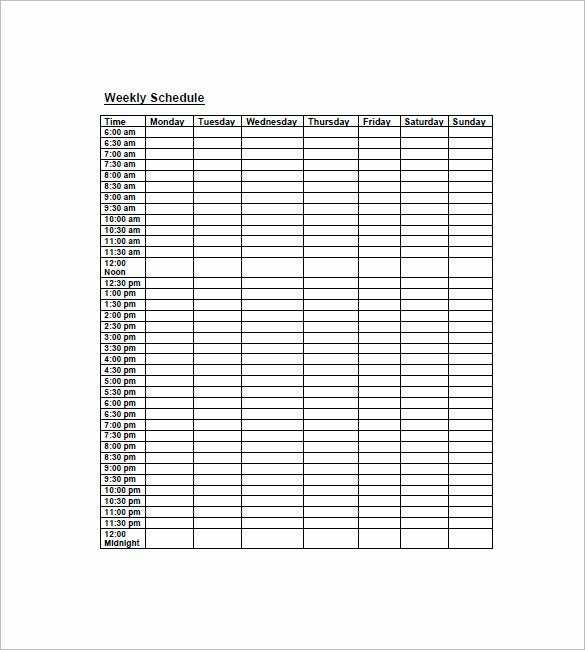 This template can be used by departments for distribution amongst its members for filling in their schedules and work they will be completing for the day. One can seek this template online for free access in PDF Format. mc.edu | A printable weekly agenda template is free to use and easy to avail template containing an agenda for users. A person can use this template for organising his/her schedule better. Since this template ensures one timely management of our duties. Mentioning hours of the day in rows and days of the week in column, this template ensures that the user ends up spending his time in creating value. Access this free template online in PDF Format. ets.fhda.edu | A weekly agenda template is a free to download template that serves as a great mode for filling up a student’s schedule well. 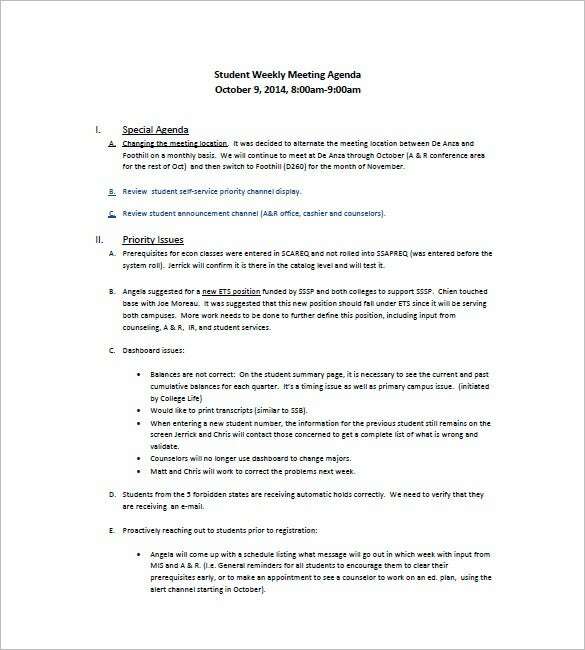 Through this template the school management can work to manage the student’s time and duties very well. 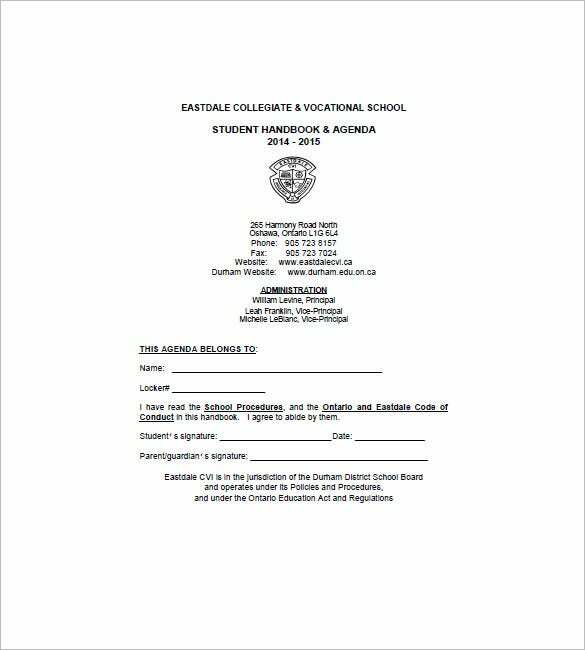 Specifically designed for students, the purpose of the agenda document is to reach out to students properly so that the eventual result is an organised schedule. 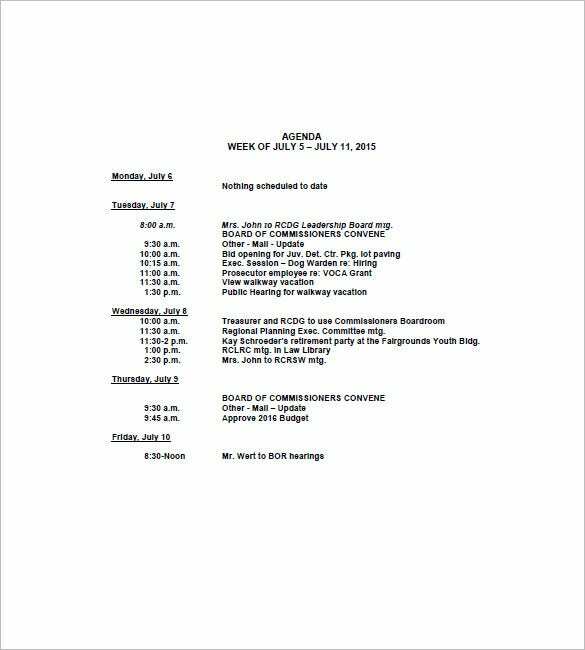 The agenda template is like your guide for the entire week. You must carry the agenda with you every time and whenever you don’t know or are confused about what to do, you should have a look at your weekly agenda. 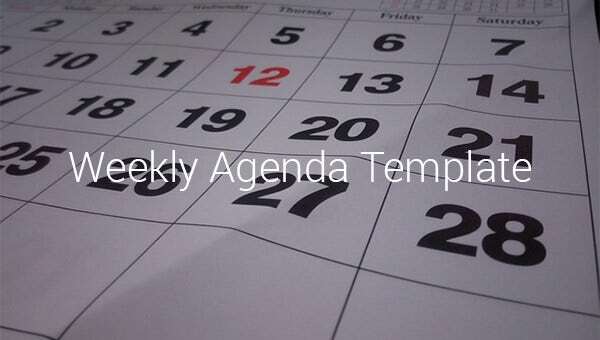 > Why do we Need a Sample Weekly Agenda Template? Sample weekly agenda templates are a great medium for students, teachers, employees as well as householders to manage their life and work better. A way of time-management, sample weekly agenda templates ensure the user a good way of scheduling his/her time well. The templates can ensure the user a great medium of organising. Organising eases the work and it reduces the burden, thus people are often suggested to maintain an agenda or schedule before engaging in an activity or work. This is when these templates will prove themselves effective. 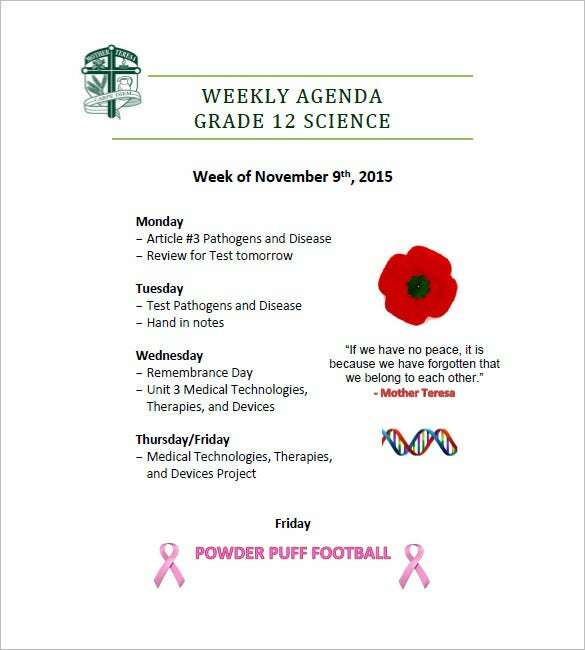 > When do We Need a Sample Weekly Agenda Template? Sample weekly agenda templates ensure the user access to good-quality templates that are available on the web portal collected from experts. The templates mentioned here are for students as well as employees who are working in an organisation. Though, the purpose for both of them of using these templates is to manage their time better. 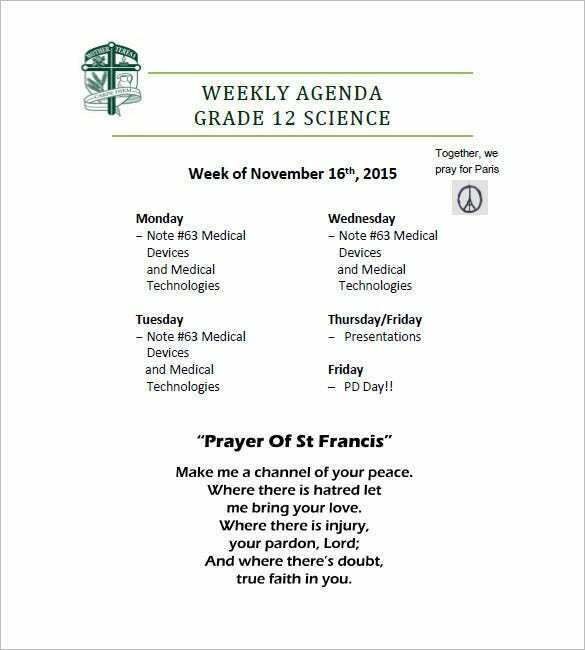 Thus the weekly agendas are necessary for all. > What are the Benefits of Sample Weekly Agenda Templates? The sample weekly agenda templates included in this link are best quality agendas available on the web. Each template is fruitful and efficient for managing the work. Weekly agendas ensure the user to work on their tasks in a time bound manner so this increases productivity. Thus these templates are beneficial for organising purpose. Apart from that these templates are available for free access which means that the user can download these templates for free quite easily. Users around the globe have been using sample weekly agenda templates for easing the process of time and work management. Through the templates listed in the portal, a user is ensured productivity and value creation at his/her place of work. One can access them from this web portal for free access which does not require one to pay any cost for usage. If you have any DMCA issues on this post, please contact us!